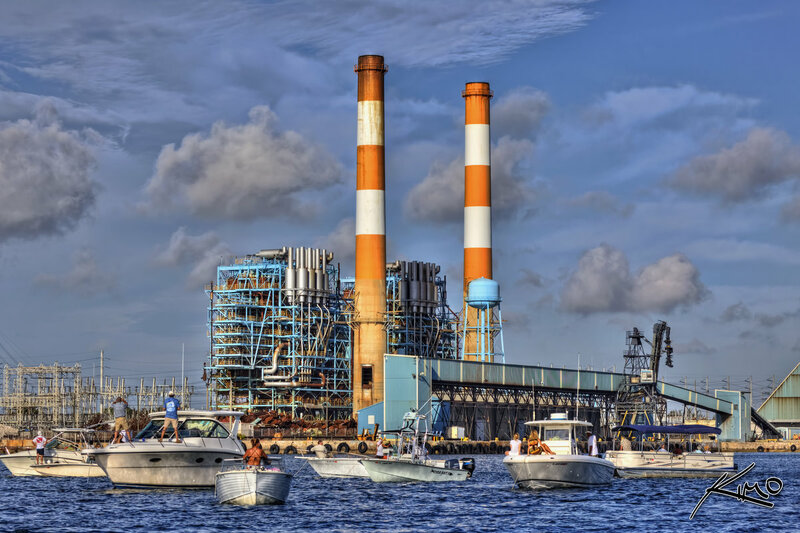 [youtube]Q1z45AzWBhs[/youtube]This power plant owned by Florida Power and Light (FPL), the big energy company in Florida, blew-up their old smokestack. 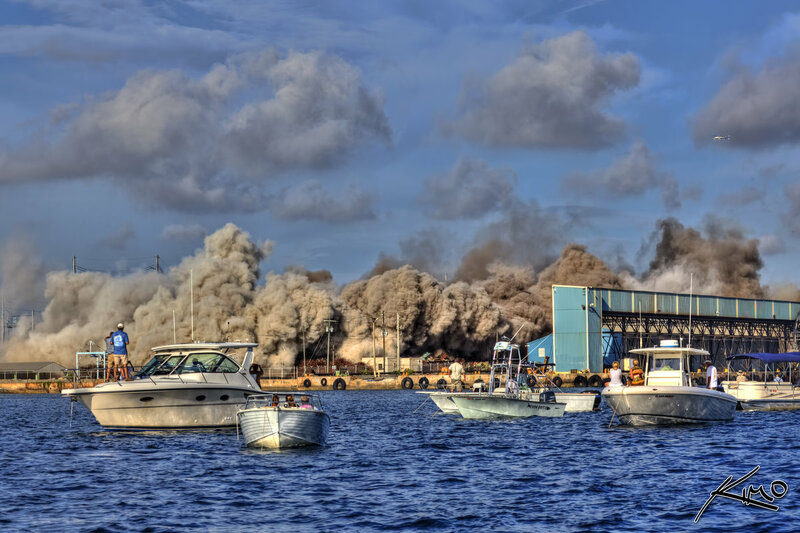 These two red and white towers was a visible landmark for Riviera Beach for nearly 5 decades. 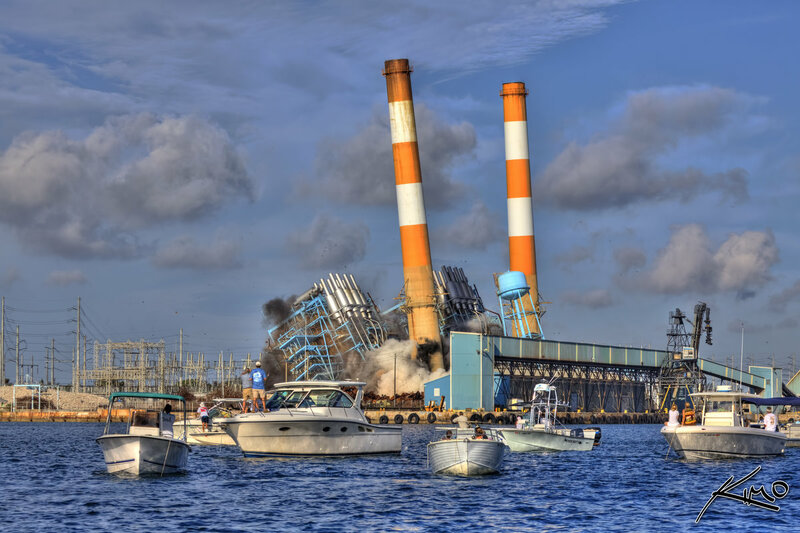 This morning FPL imploded them to make way for new smokestack towers for their energy facility. I wasn’t expecting this event to be so cool. The lighting was perfect and the boat captain drove us directly in front of the explosion. I was thinking the captain was going to drop everyone off on Peanut Island, which was much further away! I’m certainly glad I brought my camcorder along for this shoot… pictures can’t tell a story like this a well as video can! All four photos are single exposure HDR images processed using Photomatix. As most of you know I prefer to process my RAW files using Photomatix instead of Photoshop. I find that I get way more detail and color than anything Photoshop is capable of doing. However I still use Photoshop to finish off my images to make them perfect. Maybe one of these days I’ll do a book just on single exposure HDR. Of course I have to finish my HDR Portrait e-book first! Not to worry… it’s actually almost done. That’s right, the HDR Portrait e-book should be available sometime this week! Topaz Simplify – Photoshop plugin used for artistic affect.